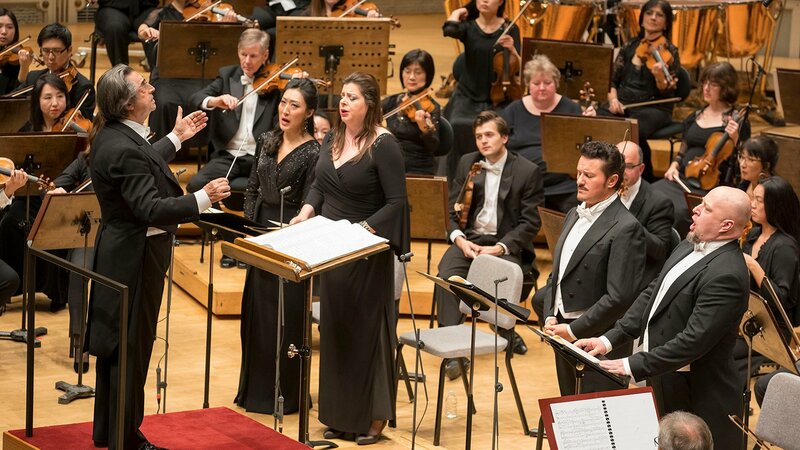 Verdi’s monumental and altogether ravishing “Requiem” is a signature work of Maestro Riccardo Muti and the Chicago Symphony Orchestra and Chorus. Their recording of the great operatic mass was the winner of two Grammy Awards (Best Classical Album and Best Choral Performance) in 2011. But in light of the recent horrific plague of senseless shootings that have ravaged this country’s schools, houses of worship and entertainment venues, Thursday night’s performance of “Requiem” at the Symphony Center brought even greater potency and fire to this work, which was written to honor two of Verdi’s most cherished fellow artists: composer Gioachino Rossini and poet and novelist Alessandro Manzoni. Originally scheduled as part of this season’s homage to the 100th anniversary of the World War I Armistice, the “Requiem” has taken on a whole new sense of immediacy and universality this week, taking the work far beyond the Catholic liturgy of its text with its impassioned acknowledgement of human guilt and its cries for mercy, forgiveness and eternal rest. Whatever your religious (or non-religious) leanings, this is music for now. The “Requiem” requires a massive gathering of forces on stage, from the orchestra, to a full chorus of more than 100 voices strong to four soloists: soprano Vittoria Yeo, mezzo-soprano Daniela Barcellona, tenor Piotr Beczala and bass Dmitry Belosselskiy. On Thursday, the performance was prefaced by Muti, who told the audience “as a citizen of the world, and as a father and grandfather,” he could not play the work without thinking of those who had just perished in gunfire of the Thousand Oaks shooting in California. He asked the audience and performers to observe a few moments of silence, and in a hall where music - one of man’s most glorious achievements - ordinarily rings out, that brief dead emptiness spoke volumes. And it suggested we would be listening to this alternately plaintive and feverish “Requiem” in a different way. The wonderfully resonant tones of Belosselskiy (backed by Cynthia Yeh on bass drums) brought an ominous tone to the warning that “death and nature will be astounded” when called to “answer to judgment.” And Barcellona’s warm, dark mezzo brought further gravitas to the knowledge that “nothing will be unavenged,” as the chorus brilliantly sounded the alarm for “a day of wrath” and was backed by the stormy, pounding sound of the orchestra. Then, if you wanted it darker (apologies, Leonard Cohen), there was Belosselskiy full of contrition, with the orchestra again conjuring the full force of the coming “day of wrath, day of anger.” And it was followed by a heavenly blend of the quartet’s voices, and the chorus and strings, in yet another plea for mercy and eternal rest as they all “pass from death [to eternal] life” and as Yeh’s voice, along with the orchestra, magically conjured the ascent into the lightness of a higher realm. That otherworldly quality extends to the Sanctus, as the double chorus proclaims the glory of a higher power and spiritual rebirth, and also to the Agnus Dei (“Lamb of God”) and Lux Aeterna (“Eternal Light”) sections, with the birdlike notes of the flute suggesting a flight to heaven. Yeo soars in the work’s finale, “Libera Me” (“Deliver Me”), yet another plea to be saved “from everlasting death” by the higher power who will “judge the world by fire,” as timpanist David Herbert sounded that wildfire-like terror and roaring release that cedes to a sublime, suspended peace. So many elements must be brought together here with a mix of clockwork precision, as well as the sense of a fervent quest for “requiem” (“eternal rest”). Muti, and his orchestra and soloists, along with the extraordinary chorus (directed by Duain Wolfe), were in total unity. And if there is any further need to confirm Verdi’s genius for deploying the human voice as an instrument of both uproar and healing, the “Requiem” should put it to eternal rest. Muti and the CSO (joined by the Tokyo Opera Chorus) will perform the “Requiem” twice during the orchestra’s upcoming Asia tour with concerts in Japan on Jan. 31, 2019 and Feb. 2, 2019. Set for release on Nov. 30 is the CSO Resound recording, “Riccardo Muti Conducts Italian Masterworks,” with Maestro Muti leading the Chicago Symphony Orchestra and Chorus in a selection of works by the great 19th century Italian composers Verdi, Puccini, Mascagni and Boito. Recorded live at the Symphony Center in June 2017, the recording will stream worldwide on Dec. 7. CSO will perform the Verdi “Requiem” Nov. 9 and 10 at 8 p.m. at Symphony Center, 220 S. Michigan. Running time is 90 minutes with no intermission. For tickets ($53-$326, with limited availability for this highly in-demand concert), call (312) 294-3000 or visit www.cso.org.